Attention EPB Customers - We have been notified that some of our customers have received phone calls demanding immediate payment for past due accounts via credit card. This is a scam. Please, do not give out your information to anyone who calls requesting your credit card information over the phone. Glasgow EPB does not, and will never do business this way. If you have any question about your account, please call our office at 270-651.8341. We recommend that these matters be treated like any other criminal activity. Report these matters to the Glasgow Police Department so that they can investigate these activities. Our staff, our Programming Committee and our Board of Directors have worked diligently over the past few weeks trying to negotiate a reasonable agreement with all of our ABC, CBS, NBC, FOX and CW programmers. While we were able to reach an agreement with some, there are others who we have decided that, in the best interest of our customers, will be dropped from our service with all changes taking effect January 1, 2015. First, WNKY, the CBS and NBC affiliate from Bowling Green demanded the largest increase at the rate of 1,000%. We simply could not accept this for our customers, and have decided to drop this channel, but fear not! We are replacing it with WSMV from Nashville and will continue our carriage of WTVF also from Nashville. You will have the same great CBS and NBC programming as always, along with quality news and weather coverage - both at a lesser rate than WNKY’s demand. You may see a message on their channels soon to contact us to demand we keep them on our service. But we believe the majority of our customers will agree we have found the better solution. We will also be dropping WMYO and WDRB, due to the sizeable increases demanded by both channels. We are pleased to add WCZU, a new channel from Bowling Green that duplicates MyNetwork TV carried by WMYO, and also promises carriage of ACC sports, including U of L.
When all of these changes are combined, you will see a $5 per month net increase in the cost of our basic + classic package. We sincerely regret this change, but with the demands of the broadcasters to continue the carriage of the programming for ABC, CBS, NBC, FOX and CW we simply have no choice. We sincerely appreciate, and value, the input from each of our customers as we struggle to determine the best course of action for all of our customers while maintaining the lowest cable rates in the entire United States. Gather around Glasgow folks. We have some serious business to discuss regarding your cable television service. Between now and the end of 2014, we must negotiate new agreements with the broadcast stations, like WBKO, WNKY, WTVF, WHAS, WMYO, and WDRB . These stations have all decided that we cannot continue carrying their signal unless we pay them a sizable sum for permission. It is the size of that sum that we need to discuss. They are asking for staggering increases in the monthly licensing fees. Our Programming Committee, consisting of 5 of your fellow citizens appointed by our Board of Directors, is deeply involved in negotiating the lowest possible rates and best option for our customers. Here’s our dilemma: We either pay them or stop carrying their signals. We have now received notices of rate increases ranging from 170% up to 1,000%. If we keep the channels as they currently stand, based upon these demands we would all see our rates increase approximately $7.60 per month just to pay for these channels. And make no mistake, this is not applicable to just Glasgow EPB customers, this applies to every cable company across the nation as they negotiate with the broadcast stations. We are proud to still offer the lowest cable rates in the United States (yes, you did read that correctly – Glasgow enjoys the lowest cable rates in the United States), and we will make every effort to continue to do so. We predict that most of our customers would say, “Drop them!” when seeing this huge increase based on the broadcasters’ demands. That would be fine with us; however, there is a very sharp hook in that bait. Dropping WHAS and WTVF would leave us without our long-enjoyed access to the Louisville and Nashville news sources that we have relied upon for years. Dropping WBKO might leave us with no ABC, no FOX, and no CW programming at all, as they have the legal right to refuse us access to other stations that duplicate their service. By now you are likely shaking your head in amazement that these conditions exist in our country. After all, can’t we still put up an antenna and get these stations over the air for free? For the Bowling Green stations, that is largely still true. For the Louisville and Nashville broadcasters, that likely would not work anymore. The conversion to digital broadcast technology in 2009 rendered signal acquisition by a homeowner practically impossible if you live more than 50 miles from the transmitter. That makes Nashville and Louisville stations a big problem. These stations, who use the taxpayer-owned airwaves for free, are allowed to set their prices at whatever rate they desire, simply because a cable company puts up a very tall antenna, catches their broadcasts from the air and distributes them for the convenience of the cable customers and the benefit of the advertisers that pay the broadcaster for distributing their commercials. What rights and protections do we have to address this outrage? Well, not a lot. In 1992, Congress gave broadcasters the right to demand compensation for their signals, and cable operators were granted few legal options to resist the station owners’ unreasonable pricing and exclusive carriage demands. As the cost of carrying broadcast stations reaches atmospheric levels, the only solution now is for Congress to update its outdated rules. There really is no way to avoid that fact. While we are posting this to give you all a chance to weigh in on these matters, we know that all of our hands are tied due to the way our current laws are written. We want to hear from you; however, the broadcasters and our elected representatives should hear loudly from you as well, because this situation is blatantly unfair with the broadcasters holding all of the cards and you holding the bill. It is fall in Glasgow. The leaves and landscape are changing, and some changes are coming to EPB’s cable television lineup as well. Like so many times over the last few months, our negotiations with the programming providers are causing us to reconsider what channels we offer. The first change is about to result in G4 (EPB Channel 147 and HD Channel 552) being dropped from our system on November 30. As in most programming changes, the reason for this change comes down to money. NBC Universal owns G4, and has announced they will discontinue it in the near future. They also own NBC Sports Network. NBC has just purchased rights to some NASCAR races and has increased the cost of NBC Sports Network to cover the cost of this programming. In order to help us pay the increased cost, they gave us a chance to drop G4, and we are going to take it so as to keep our programming cost increases down. This is not the last change you will see before the end of the year. We are in discussion with the broadcast stations in Bowling Green, Louisville, and Nashville. The early indications are that the broadcasters are going to ask for whopping increases in the fees we must pay to carry many of those stations. Already one broadcaster has asked for a nearly 400% increase! Simply put, we are not going to pay such ridiculous fees because we would simply have to pass them along to you. Any station that makes such a demand will very likely be dropped from our system at the end of the year. These discussions will be going on throughout the month of November. We will keep you posted, and even ask for your advice, via our social networking sites so we can make sure to represent your feelings correctly in these discussions. Stay tuned. The programmers are not through socking it to us through their fee demands. In January we will have to adjust our cable rates to reflect all of our new costs for programming agreements signed during the last half of 2014. We will tell you how all of this is going as soon as we have deals completed. 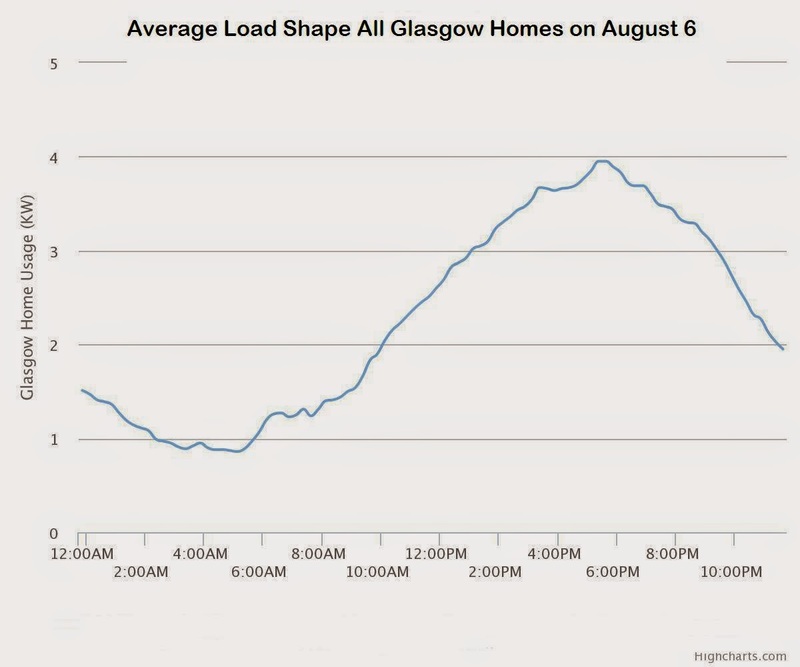 On Wednesday, August 6, 2014, at 3:00 in the afternoon, the City of Glasgow likely set its maximum peak electrical demand for the month. We recognized this a day ahead of time, based upon our understanding of Glasgow’s electric power customers and the weather forecast for the day. Though we used nearly every method at our command to notify everyone and ask for help lowering this demand, as you can see from the graphic below, we still set a peak demand that was sharply higher than the previous peak for the month. That means that EPB will pay TVA a lot more money than we would if the demand had remained lower. This reveals a problem in the way our present electric rates work. Customers like these heeded our call to raise their thermostat setting and avoid other afternoon electric usage. 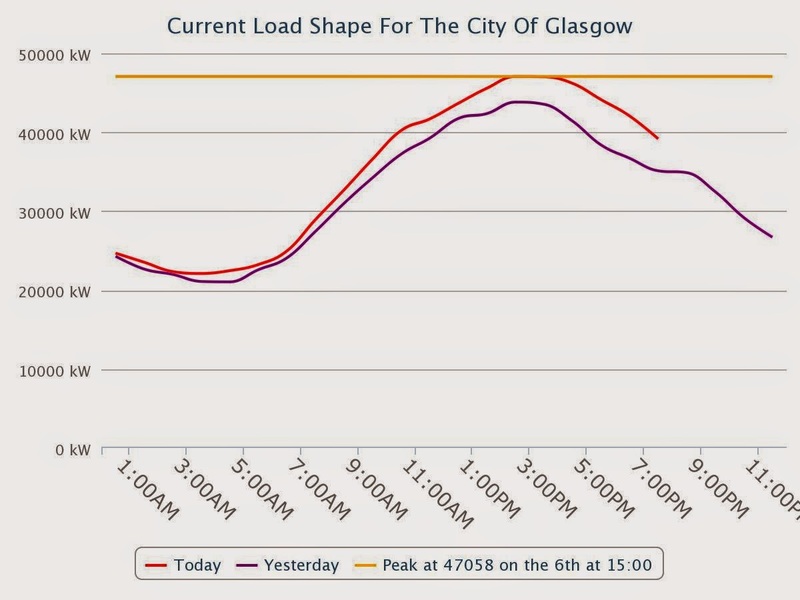 Note how their demand dropped sharply during the time just before and after the time of Glasgow’s 3:00 peak demand. Glasgow EPB’s payment to TVA for the energy required to serve a customer that responds like this is far less. In fact, the approximate wholesale demand charge we incurred to serve this customer on August 6, 2014, was only about $18. 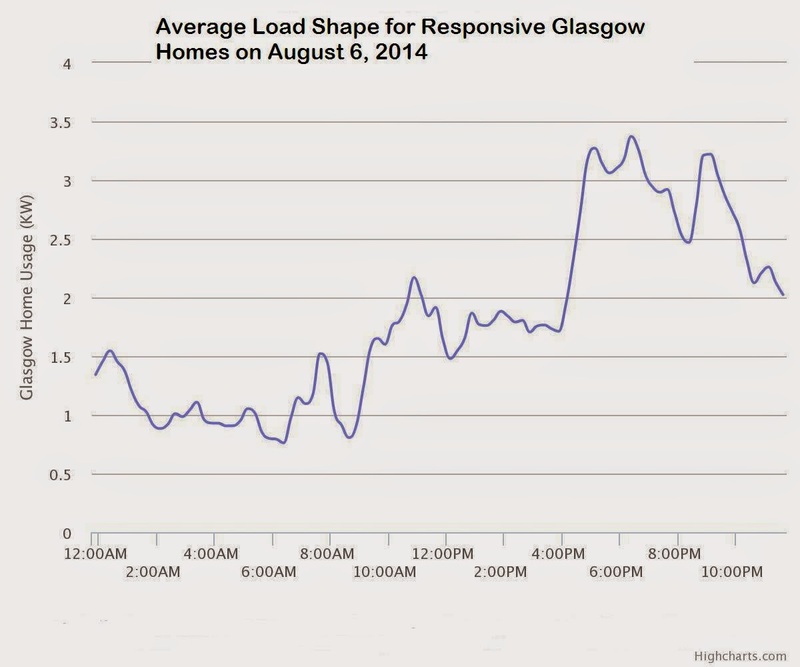 But thousands of our residential customers had a load shape that averaged out looking more like this. As you can see, this load shape is actually the reverse of what we needed to lower costs. The average residential customer’s demand for the day actually was higher during the afternoon period, and that is the reason why we set a new peak demand. The wholesale cost of the demand from TVA to serve this average customer for that day was about $35. However, over the whole month of August, both the customers who responded and those who did not, because of the antiquated nature of our retail rates, will pay about the same amount for their electric power for the month. This situation represents an inequity that we must resolve with a new rate structure. It is clear that asking for help is not going to be the ultimate solution to this problem. Eventually we will be putting a new retail rate in place that collects the proper revenue associated with serving each customer, depending on the actual costs created by the way each customer uses energy. When such a rate structure is in place, there will clearly be winners and losers. For those that can respond to peak demand predictions and lower their consumption during the peak period, like the ones represented by the purple line below, a lower electric bill will be realized. We expect to be able to help people do that through the research we have been doing on water heaters, appliances, and thermostats for the last few years. 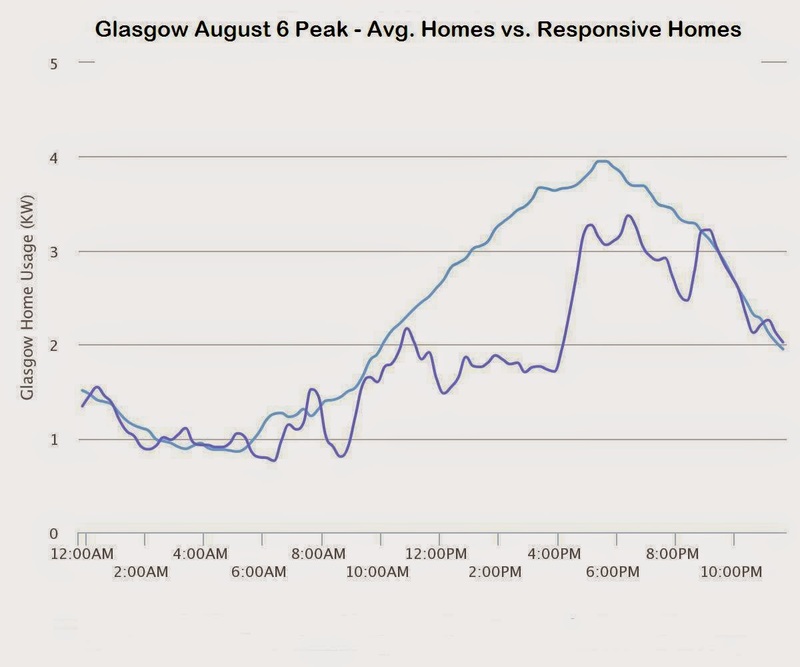 For those that cause higher costs due to their high demand during Glasgow's peaks, like the ones represented by the blue line below, higher bills will result. We will continue this conversation as we learn more and more about how usage patterns impact everyone’s costs. This is only a prelude to the way electric rates will need to evolve over the coming months.However, you can start participating in this new way to think about how you use electric power right now. You can sign up for our EPB Meter Portal and get real-time information on how your home, or business, is using energy. Just call us and we will help you get signed up for it. You can also apply for our ongoing research project with TVA, wherein we are furnishing, free of charge, a very effective ecobee WiFi enabled thermostat, to study how these devices can be used to help you become a member of the purple line instead of the blue one. Again, if you want to be a part of this early trial of these new concepts, just give us a call at 270-651-8341. Janice Crenshaw was not a long term member of the EPB team. She did not join us because of her education and experience at operating complex networks or business systems. One might think that her unexpected passing on Monday, June 9 wouldn't have a big impact on us, but that would be far from true. Both Janice’s life, and her passing, will have a profound impact on our team, and on our community. Janice Crenshaw joined our team initially as a member of our Cable Television Programming Committee. She earned a reputation there as a thoughtful and active representative of our customers as we wrestled with tough decisions relative to programming choices and the cost of those choices. A little over two years ago when we needed a temporary employee to fill in for another team member on maternity leave, we were able to convince Janice to take that job. That decision was not a simple one for Janice because she was also very involved in helping others through her work for American Red Cross. Janice had agreed to be one of the folks that Red Cross sends in to help folks in neighborhoods afflicted by some sort of disaster. She was a natural for that kind of work. Somehow we pulled her away from that assignment and Janice joined the EPB team. After that, she immediately began to change us all with her limitless concern for others. We learned from her about solving conflict with love instead of brute force. She taught us how to sow calm and harvest understanding. She also taught us about the pure joy of sharing, and we are all a bit heavier because of her favorite thing to share – wonderful home cooking delivered when you least expected it, and for no reason other than the joy of friendship. Monday’s announcement that EPA will soon implement new restrictions on greenhouse gas emissions from power plants seems to have already caused everyone to chose a side and decide who they should hate relative to this new initiative. Just in case there are any local folks who have not yet chosen a side, I offer some non-political thoughts on what EPA is trying to do, and how it might impact us all, nationally and locally. Since Monday it seems that nearly all of Kentucky’s congressional delegation (and those who are presently trying to enter that delegation) is 100% committed to opposing the new regulations. Since these sides and positions were chosen so quickly, one must infer that this is done to gain the favor of an industry that often gives big dollars to political campaigns – the coal industry. Make no mistake, the positions already taken by our legislators can have nothing to do with making the lot of us Kentuckians better, because they have not had the time necessary to totally understand the impact of the new regulations. That has to make us all feel that they take this position as the spokespersons for the coal industry, not as representatives of our welfare. I am about to suggest that there is a middle ground. Beyond the elected folk, there is already great opposition to the new regulations because we have been told that electric power rates will soar. Even if that were true, should we not also take into account the nagging little issue that burning coal causes a warehouse full of health and climate issues, most of which, if properly monetized in the same recognizable form as our monthly power bill, would dwarf the economic impact of higher electric bills? Don’t take my word for it. I am not a climate expert. I’m not even a chemist, but I know there are such folks in the world, experts who have earned the right to warn us about climate change, and one must be consciously drowning them out not to hear, and recognize, that we probably are slowly destroying everything we love with each kWh produced by burning fossil fuel. Just how much might our monthly electric bills change under this new regulatory environment? Well, that is a subject I am qualified to speak on. Like most things, the answer depends on how you ask the question. For example, if the electric power industry continues to do tomorrow, pretty much what it did yesterday (that is the favorite method of operating for my utility fraternity), the impact on your electric bills, locally and nationally, would be staggering. But in the real world, we ought to expect that new economics would bring about new solutions, new ideas, and an evolution of thinking about how electric power should be supplied to our communities. Auto makers responded to evolving fuel costs and pollution regulations by producing cleaner and more efficient cars and trucks. Surely the electric power industry can do as well as they have done. In 2014 and beyond, we should be able to design electric power solutions that are yearning to become viable, needing only a little change to the status quo to flourish. If you happen to be a customer of Glasgow EPB, you already know how we have been changing our relationship with you over the last couple of years. We are attempting to predict when our peak demand might occur and we are telling you about that, and researching technologies that will allow us to work together to help mitigate those peaks, with very little impact on the way we live our lives. Coming soon will be a totally new retail rate structure that will amplify those peak predictions and assign costs to customers based upon the time of day when they use energy. These are solutions that are designed to work with more stringent regulations on TVA and other utilities, and help them accomplish the goals of these new regulations. These experiments we have been doing are proving that we can reduce our dependence on coal fired, and other less efficient forms of generation, by learning how to moderate the way we deliver, and charge you for electric power, effectively reshaping the demand which generation resources must deliver. So, there are ways to move ahead and utilize cleaner electric power generation resources. There are solutions that will allow us to enjoy life and electric power, while we also turn back the clock on the impact we are having on our air, water, and climate. Before you chose a side and start lambasting the other side for its lack of sophistication, remember there are possibilities that are available today. We are not bound by the way we operated utilities for the last century. We have a chance to use this chaotic time to our advantage. We are ready, at least as ready as any community in our country, to move toward a lasting peace, instead of joining in a war that seems already to be declared. There is a new link on our website that we hope you have noticed and clicked, www.tvonmyside.com The Glasgow EPB, along with every other cable company in the country, will be dealing with many issues this year related to cable programming and the outlandish rates many of the programmers will be requesting. Just in case you may have forgotten, or were unaware, over 90% of the channels on the EPB cable service require that we pay a monthly fee for the right to carry their programming. Some programming already carries a rate of more than $5.00 per subscriber/per month, for one channel! Preliminary estimates have suggested that programmers will request increases this year of 100%, or more, for some channels. We purchase the majority of our programming through a cooperative called NCTC. The new link is provided by NCTC to help educate and inform all cable customers of the ongoing negotiations with these various programmers. Added to this already confusing mix is the fact that we must negotiate with the broadcast channels (ABC, CBS, NBC, etc. ), to carry them on our cable service. These are the same channels that just a few short years ago we received via antenna directly into our homes and who negotiated a wonderful deal so that they use our public airwaves for free. Every three years each cable service across the country must renegotiate with these programmers, and unfortunately 2014 finds all of us in that process again. We currently pay well over $10,000 per month just for these channels. One more thing to remember, all of the money for programming is removed from the Glasgow economy and sent to a corporation whose CEO typically receives multi-million dollar pay packages. We’re going to be talking to you a lot in the coming months, and we want your input as we try to make these difficult and costly decisions. You can always reach us at epb@glasgow-ky.com or on our FB page at Glasgow Electric Plant Board. Or you may contact any of the following local citizens serving on our Programming Committee and who make final recommendations to our Board of Directors relative to all programming matters: Petie McLean, Joe Trigg, Mary Burchett-Bower, Beverly Vance, Karl Napier and Jodi Crane.